How common is dental disease in cats? Dental disease is one of the most common medical conditions seen by veterinarians. The most common problems include gingivitis, an inflammation of the gums caused by the accumulation of plaque, which can develop into periodontal disease, and tooth resorption which affects more than half of all cats over the age of three. What are the clinical signs of dental disease? Most cats do not display signs of dental disease even though they are in pain. Pain may be shown by pawing at the mouth or head shaking. They may chew with obvious discomfort, drop food from their mouth, swallow with difficulty, or drool excessively – their saliva may contain blood. Halitosis, or an unpleasant breath odor, is also common. Dental disease and oral pain may account for the finicky appetites that some cats display. Many cats will refuse dry food and demonstrate a preference for moist or canned foods. Some cats will have a decreased interest in food or may hesitantly approach their food bowl and then show a reluctance to eat. This may lead to weight loss, which can become quite noticeable. Gingivitis and periodontal disease are caused by the body’s immune response to daily plaque accumulation. 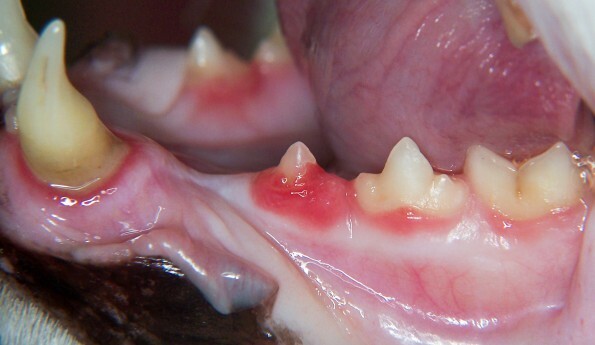 The cause of tooth resorption in cats is currently unknown. Is gingivitis always associated with dental disease? 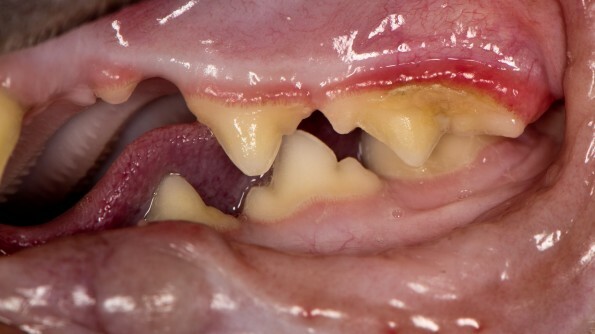 It may be normal for some kittens and adult cats without evidence of dental disease to have a slight degree of redness appear as a thin line along the edge of the gum. Some cats, however, develop severe oral inflammation called stomatitis – they actually become allergic to the plaque on their teeth. The cause of this condition is poorly understood, but it is likely caused by several factors and may differ in individual cases. The only treatment that has produced consistent results is extraction of either all of the teeth or, in some cases, only those teeth behind the canines to decrease the plaque-retentive surfaces. With extraction, 60% of affected cats are cured, 20 % require additional care to control the disease, and 20% are not cured. Tooth resorption is a progressive destruction of the tooth root resulting in slowly deepening “holes” in the affected teeth. Once sensitive parts of the tooth are exposed, these lesions become intensely painful and the only effective and humane treatment is to extract the tooth. While the cause of this disease is unknown, poor oral hygiene can play a role in the disease process (see handout for “Tooth Resorption”). What should I do if my cat has signs of dental problems? 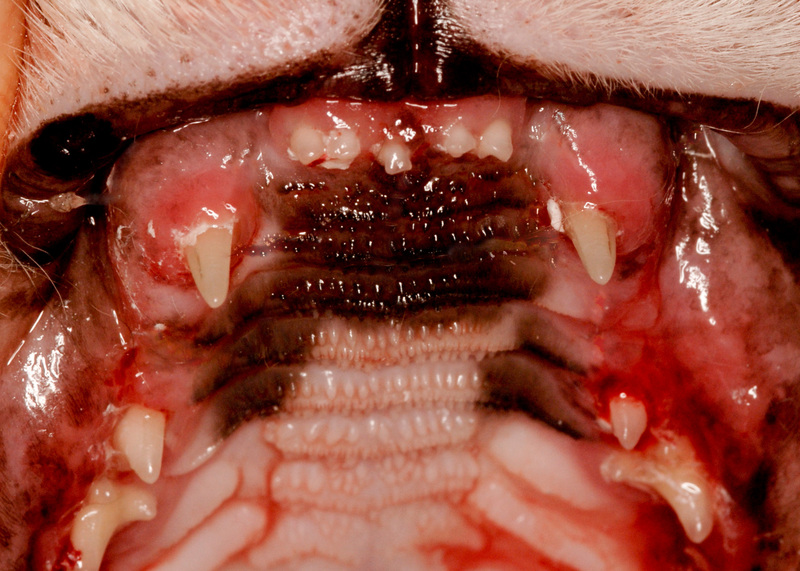 If you see that your cat has evidence of tartar accumulation, gingivitis or is exhibiting any signs of mouth pain or discomfort, you should take him to your veterinarian for an examination. You will be advised of the most appropriate course of treatment, which may involve having your cat’s teeth examined, professionally cleaned, and x-rayed under general anaesthesia. 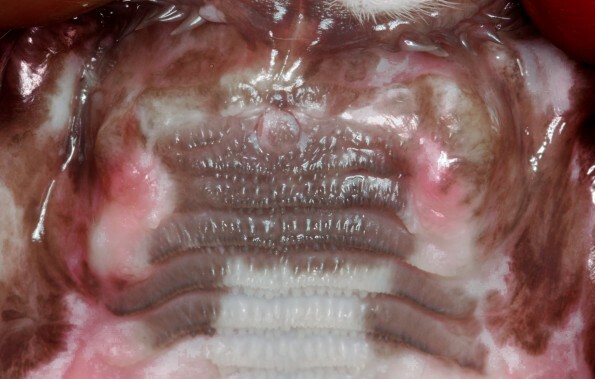 The rate of tartar accumulation is highly variable between individual cats, and in some cases, this may necessitate professional cleaning on a regular basis, every 6-12 months. Do not try to remove tartar from the teeth yourself with any form of metallic instrument. Aside from potentially harming your cat’s mouth or him harming you, you may damage the surface of the tooth by creating microscopic scratches; these will provide areas for bacteria to cling to and will encourage faster plaque formation which only makes the problem worse. This is the reason your dental hygienist always polishes your teeth after removing tartar with dental instruments. What can I do to help prevent dental disease in my cat? The best way to prevent dental disease is to reduce the rate at which plaque and tartar builds up on the teeth. Recent advances in pet nutrition have resulted in water additives, treats and diets that can reduce tartar accumulation. The Veterinary Oral Health Council (VOHC.org) only accepts products which have been shown to reduce the accumulation of plaque and/or tartar. The most effective way to reduce plaque and tartar is to brush the teeth. A number of toothbrushes are specially designed for a cat’s mouth. Never use human toothpaste on cats. These are foaming products and contain 9ingredients that should not be swallowed as they could cause internal problems. Use pet toothpastes that are non-foaming and safe to be swallowed – they’re available in flavors your cat will find appealing. Q-tips dipped in tuna juice are also effective in controlling the daily accumulation of plaque. With gentleness, patience and perseverance it is possible to brush your cat’s teeth and provide the oral care needed to prevent dental disease.